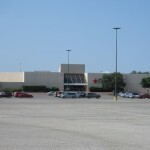 Austin’s Highland Mall has become one of 2009’s most famous dying (though not yet dead) malls due to some high profile craziness and catfights. What’s going on down in the Lone Star State? I got to check it out for myself a couple weekends ago when I made my first visit to Texas (not counting my two brief swings through Amarillo, anyway). 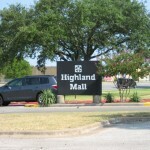 The Highland Mall, developed by James Rouse Company, opened in 1971 as the first enclosed shopping mall in the Austin metropolitan area, just a few miles north of downtown and the University of Texas at Airport Blvd. and I-35. The center’s pretty well located to the city center and the north and east sides of town, but Austin has been one of the fastest growing cities in the U.S. in the past decade, and has sprawled dramatically from the city center, bringing more of the population closer to other malls. There’s also one huge, gleaming new outdoor mall (The Domain) that’s in the process of expanding dramatically and it has likely stolen most of Highland’s customer base. It seems Highland did a pretty screaming business for a long time, possibly until as recently as a few years ago. The center was expanded in 1979 with a new wing and new anchor (Foley’s) adding to its original three, and given another renovation in 1987. The center today has four anchors: Macy’s, Dillards (two stores), and a vacant space that had been JCPenney from 1971 until 2006. 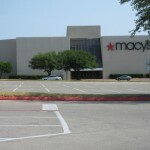 According to Wikipedia, the Macy’s had been a Foley’s until the 2006 Federated merger. 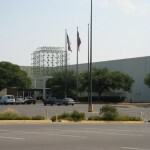 The Dillard’s at the southern end of the mall had been a Joske’s location until Dillard’s acquired the chain in 1987; the other Dillard’s space was until 1992 a Scarboroughs, a local Austin chain. 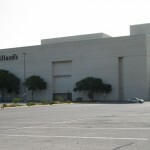 In early April of this year, Dillard’s announced they were suing the Highland Mall Limited Partnership–the mall’s owners, made up jointly by GGP and Simon–for letting the mall deteriorate so sharply. This was a very unusual move that made national news–and we covered it here. The best part was a big brouhaha where Dillard’s was upset about having some co-tenant that supposedly sells toilet paper (I didn’t notice it). Mall owners countersued, basically accusing Dillard’s of making crazy stuff up to get out of their lease. Dillard’s wants to shut both of their stores and is seeking to cancel a lease for one of them. 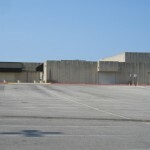 Also in April of this year, mall management made the controversial decision to close the entire mall on April 4 during the Clyde Littlefield Texas Relays event in Austin. The Texas Relays draw thousands of fans each year–mostly African-American–to Austin, and mall management closed the mall due to what they termed “security concerns” during the event. Yow. The NAACP was understandably livid, and planned a demonstration as well as calling for a boycott of the mall. This is especially damaging since Highland Mall’s location within the Austin metropolitan area places it closest to East Austin–the most heavily black area of the city. It seems a questionable business decision to alienate your customer base by insinuating that an entire race of people are criminals. Now, let’s get realistic for a second: Highland may have a bit of a patina to it, but it didn’t seem that bad to me. There were still plenty of A-level tenants (Gap, Forever 21, etc.) and it didn’t even seem to be struggling with that severe of a vacancy problem. The original 1971 portion of the mall was a little dated, but not severely so (nothing that, say, some new flooring couldn’t fix). The Macy’s wing felt almost newly renovated. I was there on a sunny weekday morning, but the place felt totally safe to me. Also, downtown Austin is located only a few miles to the south, and is rapidly urbanizing and filling up with moneyed young professionals. For all the things Austin has to offer–including tons of bars, restaurants, and one of a kind boutiques–there’s not a ton of the kind of chain retail that’s found in the city’s malls. With a proper repositioning and clean-up–added entertainment options, for example, or an essentials retailer like Target–the Highland Mall shouldn’t really have much trouble coming back. “Look at the immediate surroundings in every direction, and it’s generally what people refer to as Class B,” Sarwal said. “It could be Class B office or retail space, or Class A industrial. I don’t anticipate seeing Highland Mall transform into the next Domain or Mueller or La Frontera. Either way, it seems everyone’s rapidly giving up on this old place. This mall is definitely on its way out. I visited this mall twice this past May and the mall really has taken a nosedive over the past two years. 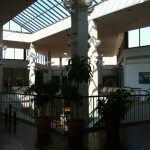 These are some nice shots of the mall. Were these pictures taken before the mall opened? 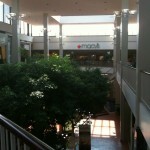 For additional pictures of the mall check out my small blog. @Johnme, the pictures were all taken just a few weeks ago–Monday, June 29–at about 10 in the morning. The mall WAS open but it had only been open maybe 15-20 minutes when I took the shots. I enjoy the Macy’s exterior…it’s the “Foley’s 1970s look” and can be identified by the white exterior, “slanty” skylights above the entrance, and a diamond-shaped shape from Google Maps. I forgot to mention this on my first post. A Target is located across the highway to the Southeast of the mall that took over a closed Montgomery Wards site. There is also a new development on the former airport site that has most of the big box chains that would have been a good fit for a mall redevelopment. If the mall would have gone downhill 5 years ago the property would probably have been redeveloped. Everyone else nearby has beaten them to get the retail outlets. The office or soccer stadium options seem more likely for the site if the mall fails. I still like this mall because of the variety and video game & movie stores, but this decline is very similar to what happened at Northcross Mall nearby before the mall closed. Northcross was nothing but comic book stores, video game & movie stores and offices with the old ice skating rink before it completely closed down and was halfway demolished. 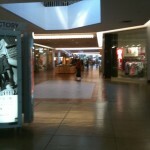 The remaining part of the mall has a small hallway with a new ice skating rink and some offices. The outside is slowly filling with retail and restaurant tenants and the property is awaiting a Wal-Mart to be built on the former Sports Authority (Oshman’s) site. GGP is only going to spend money on their top properties during their bankruptcy, so I expect this one to be sold to Simon (which already own half of the mall) or sold to another investor to redevelop the property. I can understand that they would close due to event that draws thousands of people. A lot of people would make the mall crowded, and could cause shoplifting. But then again, even though the mall MIGHT of not meant to sound racist, but closing because an event that brings African Americans does sound as so. However, this mall is not tiny, and I am sure it could of held thousands of people irregardless of their race. I guess rumors, strange events, and charges of “deterioration” have given this mall a bad reputation. So I assume when things get tough they want to just quit. It’s sad, and infuriating at the same time. I’ve seen the exterior of The Domain…from the outside it’s just a bunch of boxy tan buildings VERY close to the Mopac Expressway, a highway with a railroad running between the lanes. And given the Texas heat (it was 100 degrees today, at least, some miles away) why AREN’T people shopping at Highland? @Jonah Norason (Pseudo3D), You’re probably already aware, but The Domain is in the process of being expanded dramatically. I would say they’re tripling the size of the retail component and adding tons of housing and office space. I visited there as well and took some pics so a post about The Domain will surface at some point as well. It’s actually a fairly well done streetscape-style outdoor mall and will unquestionably be the best retail destination in Austin once the expansion is done. Currently it’s quite a bit smaller than Barton Creek but it won’t be for long. I still don’t have faith in outdoor centers in non-pleasant climates. Texas weather is pretty variable (but mostly pretty hot) and I think The Domain is relatively successful because it’s new. Once the newness wears off and people realize it’s just a non-climate-controlled mall with some apartments thrown around, it will not be quite as popular as it once was. 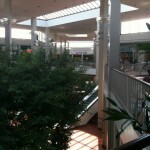 It won’t get to the point that stores jump ship for the enclosed malls, though. You can search “mall fight” on YouTube and see Highland Mall proudly featured. After seeing the you-tube videos before this article surfaced am not surprised at all they closed this year…. (just can’t have anything nice). Exactly! The mall did not close because “a bunch of black people were coming”. They closed because of all the fights, loitering and loss that they experienced w/ the Texas Relay crowds the last year. Well, the reason they close it for the relays is just that people just hang out there and loiter. Lots of people, and even if there wasn’t that “hood” throwing the “dollas” around, it’s still a pretty unsafe situation simply due to the massive number of people. Can you imagine a fire? How would everyone get out? Glad to see you got Highland Mall. This is truly a sad retail story. 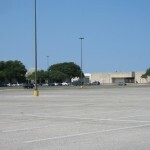 Yes, as little as 5 years ago, the mall was full, bustling with shoppers, and a valuable shopping destination for Central/North Central Austinites. It is incredibly ghost-town like now. Seems to me this is a “which came first” situation. . . after the last renovation (in the early ’90’s?) seems like the management refused to do more, so the stores quit caring, which made shoppers leave, which made the management less interested, etc. Lots of good times here! Fabulous photos. It was a great idea to take them right at the mall’s opening so you get the least amount of people around and the mall is at it’s cleanest. In regards to you writing “It seems a questionable business decision to alienate your customer base by insinuating that an entire race of people are criminals.”, I think you missed the actual reasoning behind the mall’s closing during the Texas Relays event. In the past year(s) Highland Mall has had VERY bad experiences during the Relays. The video on Youtube of the fight and another that depicts the staggering amount of loitering show just a tiny bit and a few minutes worth of what happens there during the Relays. The mall (clearly) does not have the disposible income to hire needed, extra security during the Relays event. Regarding race, the crowds that show up at the mall during the Relays, the ones who caused the unprecedented amount of problems for the mall, just so happen to be predominantly black. That’s just an unbiased fact. Furthermore, incase people aren’t aware, the mall already caters to a lower-income, large, if not predominantly black clientele… so to call the mall racist against blacks is in essence a hypocritical statement. Also, even though the Relays drew christmas-sized crowds to the mall, it did not bring in revenue. Infact, the mall was operating at a loss afterwards. (Read up on it in the story featured in the Daily Texan or just google it and read some of the personal stories/comments shared there.) 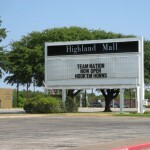 So, when Highland Mall recalled its past Texas Relays event experiences, including crime & loss statistics, a realistic situation the mall had to face was: Leave the mall open and worry about patrons getting injured during all the malay and possibly sue the mall for lack of security, and to operate at a loss like the year prior, OR close the mall early and deal with the unhappiness and political repercussions it may bring. Either way was a no-win situation for the mall and i’m pretty sure they knew that. Let me repeat, the mall simply does not have the disposible income to spend on extra security to babysit troublemakers (of any race/age) that frequent the mall during a large event that… One that has had real problems in the past. Bottom line: The mall closed for safety and economic reasons. It’s all about statitistics, lack of funds and the mall having knowledge/experience of what happened in prior years during the Texas Relays event. I noticed a few small typos in my above posting… I was running a bit late for something and did not have time to proofread it all before posting. In the third paragraph, in the last sentence, It should’ve read “that frequent the mall during a large event. (omitting the next word “that”). Thanks! Basically was just saying that the closing of the mall during the Relays was due to safety issues from past experiences and not having the resources to provide adequete security. Plain and simple. Word is the hammer is coming down soon. Two food court business just closed. Hallmark is closing, the kid’s picture place just closed, Forever 21 is on the way out as well as some others. Scuttlebutt is maybe next month. Sad stuff. Having lived in Austin near this mall for three years in ’78-’81 where I graduated from John H. Reagan H.S. This was a haunt of mine. Nice to see it is still there. I was a military brat, whose father was in the Air Force, stationed at Bergstrom, AFB. Thanks for all the photos, it brings back a lot of memories. The days of the big malls has really come to a standstill, with the economy, and all. 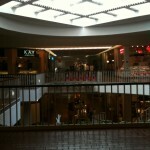 Northcross Mall was the first place I had a job, and worked at Sweet Thang, next to Dog Stop. By the old ice skating rink. Lots of memories here. Austin was a good place to live, and good memories for me. The people were great as well. Sorry to hear this place may go. It was my mom’s favorite place to shop, especially, at Folly’s. Like it or not, when increasing numbers of blacks inhabit a mall, crime goes up and white shoppers go away. Example after example prove this. It doesn’t take long for the expected crime increase along with a lack of paying shoppers to shut down a mall. Diversity – it allows the identification of cultural differences between racial and ethnic groups. Especially given the difference in population, the number of crimes committed by blacks is absolutely incredible. No one feels safe shopping with such a diverse atmosphere. Sorry – that is just the way it is. The “final death blow” to Highland Mall – the 31 year old Macy’s (formerly Foley’s) is closing at the end of a 10-week clearance sale. Well, that’s only one of two 2011 closings. Sounds good to me. I meant, in the fact that only two Macy’s closed. Not good for Highland, that’s for sure. Actually, there’s three. This one, one in North Carolina, and a sorta-standalone one in Newton, Massachusetts, next to the Mall at Chestnut Hill, which is featured on this site. 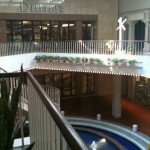 There’s one outside Atlanta – a former Rich’s in “Union Station Mall” Is that a 4th, or were you confusing it with N.C.? 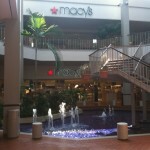 The Macy’s at the mostly shuttered Union Station Mall is closing, leaving only a Sears open at the 30-year-old center. The mall, in Union City southwest of Atlanta, was scheduled for foreclosure Tuesday. …Power at the mall was cut off in November after the owner, real estate investor Lee Najjar, failed to pay an electric bill. Najjar, who locally became known as “Big Poppa,” Kim Zolciak’s benefactor on the Bravo reality TV series “The Real Housewives of Atlanta,” said he bought the mall about eight years ago when it was already struggling. Where is this info coming from? I googled it and the only closures came from 2009 and 2010, is that from the Macy’s Website? It’s now out there as part of Macy’s December sales press release dated today . Looks like only three stores total. 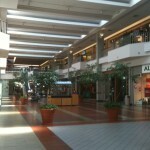 The Georgia one is called “Shannon Mall” – like any good dead mall, it looks like this one now goes by 3-4 different names. I used to shop there in the 70’s and 80’s. It was bustling with life and always packed with shoppers. A trip to Highland on a Saturday was something special and we would make a day of it. When out-town relatives visited we’d always take them there and they would be amazed of how nice it was. I remember when Susan Lucci, (the actress from All My Children) made a promotional appearance one Saturday…she was very popular back then and it was a big deal. But in 2007, my daughter needed a prom dress and she went to Highland alone. From the time she got out of car, she was stalked by a Black male driving an Escalade . She wisely called security who escorted her to her car. We haven’t been back since. 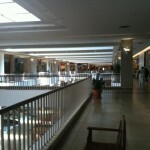 Just heard that Austin Community College will take over the mall. I guess that’s the best Highland could hope for. I heard that even back in the 1980s it was starting to become a place where a single woman wasn’t advised to go without a companion, preferably male. @Pseudo3D, I am a woman and I lived about 3 blocks from there from 1994 to 2004. I frequently shopped there the entire time I lived there always alone. I NEVER felt threatened or unsafe. I’m a native Austinite, and while I’ve always been more of a Barton Creek girl myself, this still saddens me. Highland used to be a hopping place. With Macy’s out, it’ll die fast and quiet. 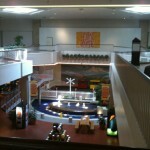 Highland Mall used to be the one and only mall from my childhood. A gal pal and I made a visit to the old mall today just to see what was left of it. 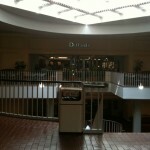 All of the department stores are gone, as are most of the higher-end retail stores. I was surprised to see that Victoria’s Secret and Bath & Body Works were still open. There were an abundance of athletic shoe stores and weird little specialty shops that sold baseball caps, sports fan paraphernalia, video games, black market designer perfumes and horridly garish quinceañera dresses. Well, think about the kind of “meh” shops that lingered in Northcross before it finally tanked. Around five vendors remain open in the Food Court. It looked so empty, it was just … well, sad. I used to go to Highland on Saturdays, and it was jam-packed with shoppers. Today, there were far more people working in the mall than there were actually shopping in it. 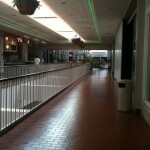 Everybody keeps saying this mall is dead, is going to go out of business. But, it still endures…. 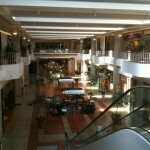 I like this mall! I used to shop at Folly’s in the 70’s here, when my father was stationed at Bergstrom AFB, and I went to John H. Reagan HS. As far as I am concerned, if this mall lasted this long, what’s keeping it from going on. Now, I am in my fifties, and looking at this sure brings back memories. Especially now, that I am incapable of walking all over the place now, even if I was there. Back then in 1979. 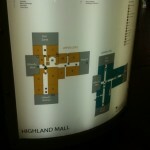 Highland Mall, seemed old in comparison to the Northcross Mall. So! Highland Mall. You keep on. And, survive!